Portable Toilet Hire London is based in Barking, Essex. Covering London, Essex and the surrounding area. We offer you Portable Toilets, Disabled Toilets, Colour Coordinated Toilets, Urinals, Modular Toilets and Toilet Servicing. We also offer portable toilets at short notice as required for long or short term projects, 24/7 Emergency Services and Same Day Delivery. If you’d like to know if we cover your area just ask. Our friendly and dependable team deliver and collect portable toilets for a variety of functions and events to assist with your toilet solution. 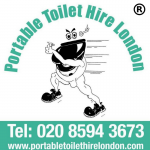 Portable Toilet Hire London is the trading name of Portable Toilet Hire (London) Limited. Registered Office, 249 Cranbrook Road, Ilford, IG1 4TG. Registered no. 09350635, Vat Registered no. 205758895. *Terms and conditions available on request. Contact us for a quote today!